This page contains a guide on the Weather Conditions present in Persona 5, including general weather conditions, specific types, and their effects. 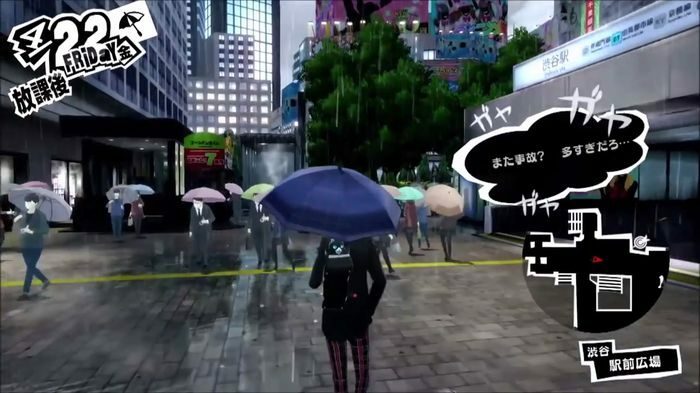 This article provides information on the Weather Conditions in Persona 5. It divides the Weather System into several classifications, including Normal Weather, and Special Weather and their corresponding occurrence and Dungeon Effects. Similar to Persona 4, Weather Conditions have effects on the activities in the real world, and the appearance of Shadows in their realm (or in Persona 5, the Metaverse). In Persona 5, Weather Conditions fall under two general categories: Normal Weather and Special Weather. Oftentimes, the condition changes between mornings and afternoons, with specific conditions locked to the corresponding day in the game. When there is an abnormal weather, the mood of people that you interact with changes. During a Normal Weather condition, it is divided into three: Clear, Cloudy, and Rain. With Rain, certain activities grant an increase in the amount of Human Parameters obtained. Some changes include the case of using the Bathhouse where there is an added bonus in Charm(+1); whereas in studying such as in Famires and Leblanc, it grants additional Knowledge(+1). Apart from Human Parameter-based activities, there are additional special item types to purchase while it’s Raining. By listening to conversations of girls inside the classroom, you will also obtain information on the trending shops. In terms of Confidants, there are also exclusive ones that are accessible only to specific weather conditions. These types of Weather Conditions alter the behavior of the Shadows in Mementos Dungeon. During an unfavorable weather condition, Rare Personas from special treasure chests are more likely to appear. I noticed after I finished the 4th palace I was supposed to get torrential rain on the next day (8/3) but didn’t. man is there any way i could edit this? the information is clear but it needs to be written better. not making fun of anyones grasp of English or anything. Hi Ios Bartholemew, thanks for the input. We have updated the article. F*ckin’ remarkable things here. I am very satisfied to see your post. Thank you so much and i am having a look ahead to contact you. Will you kindly drop me a e-mail?